ICEBOX GALLERY presents an exhibit by Colorado photographer Tom Kumpf entitled Children of Belfast. Far from being a sad distressing commentary, this photographic work is about strength, energy, and resilience of the youth in Northern Ireland. Kumpf's images take us to both sides of the conflict in Belfast. His images show how life goes on near The Peace Line, a wall of steel and brick that divides the city. 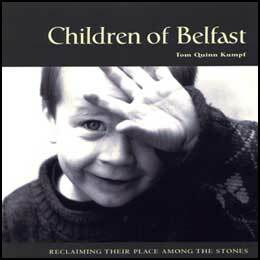 Tom Kumpf is the author and photographer of the book Children of Belfast; Reclaiming Their Place Among the Stones. Books and images will both be available for sale during the run of the exhibit. "Belfast is beautiful but bad, and its children are veterans well before they are old enough to be soldiers." -TK This heartfelt work provides nonsectarian insight into "The Troubles" from the viewpoint of an Irish-American Vietnam veteran seeking to understand the true roots of this ongoing conflict. "While it is the children who suffer the most, it's also the children who possess the solutions." -TK These children in the black and white images are Protestant and Catholic, each with genuine and heartfelt stories. Many images show children being children, playing games and posing for the camera. His film exposes the dichotomous scene of burned and broken buildings scarred by war, while at the same time the street reveals itself as a neighborhood and a playground for children. Tom has won several awards for photography, and his images have been published in numerous magazines. His past work includes an exhibition of life in Russia before and after the Coup; his exhibit Learning to Celebrate Sugar toured the U.S., while Montana Faces, an exhibition of portraits, toured Europe. The photographer and author worked with Vietnam veterans and Soviet veterans of the war in Afghanistan suffering from Post-Traumatic Stress Disorder. He is currently working on his second book about little-known prehistoric and Celtic stone circles and other mytho-archeological sites in Ireland. He lives in Boulder County, Colorado. The photographer will be present at the opening. Exhibit continues through February 24, 2001.